Discussion in 'RPG and Action Adventure' started by Press Release, Sep 13, 2018. ‘My Crypto Heroes’(MCH) is a quick and casual worker-placement RPG. Collect and train historical Heroes of the world, get special and legendary items into your to equip, compose the ultimate unbeatable team formations and challenge epic battles to conquer the crypto world! Heroes can be purchased in the pre-sale with Ethereum (ETH), and GUM (Game User Money) after the game release.There are also free heroes, so it is possible to play the game for free. 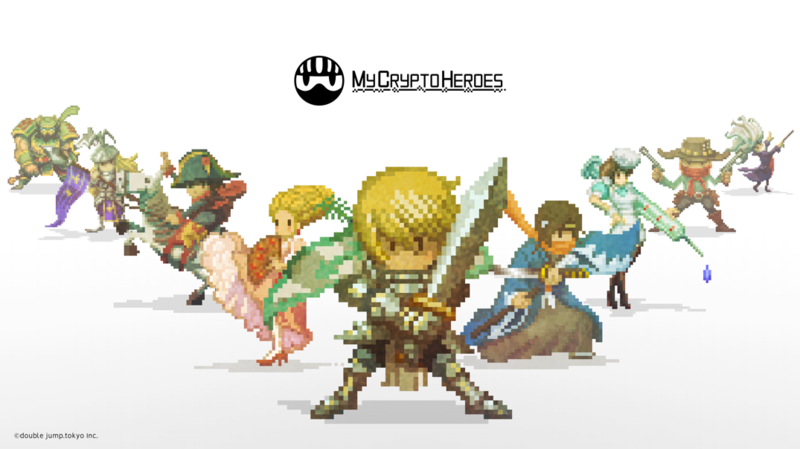 Form a team with the heroes you have acquired and go forth into the world of My Crypto Heroes! You can name and customize your hero's appearance to your liking. Through clearing quests Heroes will level up, acquiring items and becoming stronger. Extensions are equipment that powers up your hero. By defeating enemies in quests, you can obtain these extensions such as swords and armor. If you manage to get rare, special extensions, you’ll be the envy of everybody! Heroes and extensions can be bought and sold through the marketplace. Through clever economic moves, you can greatly increase your power and asset value. Land, through ownership, will generate profit just like actual real estate does. Profits are generated when other players visit your land and spend GUM while on quests." Land owned by other players can be acquired through battles. If you defeat another player in a battle, you can choose to purchase their land.Collecting lots of land and dominating Crypto World is the ultimate goal. As MCH uses the Loom Network side chain, Gas is not necessary to play the game. Heroes, extensions and other assets can be managed through the Ethereum wallet. β Battle will start on UTC 0:00 21st September 2018. In β Battle, players will be able to access the “Duel Battle” mode of the game, in which players can team up with comrades and fight together. Anybody can participate in β Battle. Heroes acquired through the pre-sale can also be used. As β Battle is a test environment, data from β Battle will not be transferred to the full version of the game when it becomes available. We are very grateful to players that contribute to the test period! Heroes, which are assets in MCH, will be going on sale before the game's release. Pre-sale Heroes are exclusively sold within the pre-sale time period. The time period and stocks are limited, so definitely don’t miss your chance to get your hands on these lucrative heroes! MCH is a game centered on battles. Therefore, gaining an advantage in battles is the most important factor to consider. The limited heroes acquired in the pre-sale, after the release of the game, will certainly become a source of benefit to you after the game release. UTC 0:00 21st to UTC 23:00 30th September 2018. The amount of ETH used to purchase heroes in the pre-sale will be returned in equivalent GUM via Airdrop after the game's release. * GUM (Game User Money) is the currency used in MCH, it can be purchased with ETH. GUM is mainly used for the purchase of heroes and for transactions between players. Within the pre-sale period, there will be collaboration heroes that can only be acquired with EMONT. There will be events in MCH in which you can obtain EMONT. In addition, we are also planning to develop various collaboration events. To those who are also users of ETHEREMON, we hope you are looking forward to it! * EMONT is an in-game currency of 'ETHEREMON'. It is an ERC-20 token and currently traded via Radar Relay. * EMONT ALLIANCE empowers game builders in the blockchain world and build blockchain game ecosystem. Founded on April 3rd 2018, we specialize in the development of crypto games. Our games cover a wide range of platforms; mobile social games, online PC games, console games etc. As well as the development and management of platform games, we have specialists in financial management relating to cryptocurrencies and blockchain technology know-how. A subsidiary of DLE Inc. (Head Office: Tokyo, CEO: Ryuta Shiiki), listed on the 1st section of the Tokyo Stock Exchange. Company name: double jump.tokyo inc.